residential roads. The new speed limit is designed to make streets safer for pedestrians and cyclists and was introduced in all areas of the city. 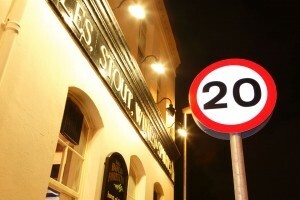 The council plans were to install prominent new 20mph signs where drivers enter the new speed restrictions as well as ‘repeater’ signs as reminders. 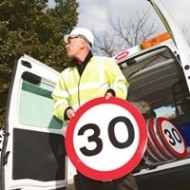 Colas (Portsmouth City Councils highways maintenance contractor) employed specialist sign installation contractors MASS Installation Limited to carry out he works to install over 3,000 signs. Due to the volume of signs required, the scheme needed a cost effective yet highly competent reflective sheeting product and Nikkalite® Ultralite Sheeting from Rennicks UK was chosen as the perfect solution.